Over the course of the late 20th and early 21st century museums have made it their mission welcome all members of the community. Since the Americans with Disabilities Act was passed in 1990, institutions have been held to new standards of accessibility for disabled individuals. Museums have made and continue to make significant efforts to meet these standards. They are becoming spaces which are accessible and welcoming for Deaf and Hard of Hearing (HOH)* individuals, though not without significant challenges. Deaf individuals face large obstacles in everyday life, and museum programming has been designed specifically to accommodate their needs. Nearly all major museums have assistive devices and interpreters available by request for Deaf visitors, but these accommodations come with a catch; “By appointment only, two-week notice required” is the statement regarding tours for visitors with hearing loss that is given by the majority of museums (Johnson 5). This statement is both heartening and disappointing. It is excellent that so many museums have options for disabled visitors. At the same time, disabled visitors are essentially denied any spontaneous museum experience they may wish to have. While Deaf individuals can enter the museum without an interpreter they face the challenges of communicating with staff for directions or other information. To address these challenges some institutions have made changes which allow Deaf visitors to engage with regular museum events. The Met holds events specifically for the Deaf community in addition to providing audio services and captioning for live events if requested. According to the Met’s website, the Gallery Talks held by the museum are “presented in Sign Language or Sign Language-interpreted on a regular basis,” and the calendar of events provides information about upcoming events at the museum. This is a successful move on the part of the Met to include accommodations for Deaf visitors in events for the general public. The Children’s Museum of Boston has days designated for Deaf visitors that not only explore the museum but feature other Deaf and deaf blind performers, showcasing the museum’s efforts to accommodate Deaf visitors while creating a unique museum experience. HOH individuals face a different set of challenges within the museums, ones that come with less cut and dried solutions. Much of this centers around being unable to hear and understand audio within the museum. An article published from the 2005 Museums and the Web conference states as best practice that audio content for HOH individuals should have “Clear, easy-to-understand narration without background music or sound effects” (Proctor 2005). Only six years later, a glowing review of interviews that played through the O at MONA was published. The interviews were praised for being raw and low-fi, and sounding like “they were recorded in a noisy café”, which gave them authenticity in an otherwise sterile museum environment (Chan 2011). When audio is not clear or sound from speakers/tour guides must compete with the chatter in the gallery, HOH individuals may struggle to engage with the exhibit. While authentic experiences can be provided through interviews that are raw and uncut, such as the ones Chan praised, they present an obstacle for HOH individuals. More energy is spent discerning the content of the audio than on the exhibit’s meaning. While museums publish less content on their websites about resources for HOH individuals than the Deaf community and audio content like the O at MONA exists, many museums have taken steps as part of their everyday installations which signal forward motion. One example is the BMA’s current exhibit Imagining Home. The BMA uses headphones and open captioning for multiple video screens rather than playing audio directly to the audience. While there are limited pairs of headphones, occasionally causing lines in the gallery, they allow visitors be able to focus entirely on the content of the audio without the background noise. 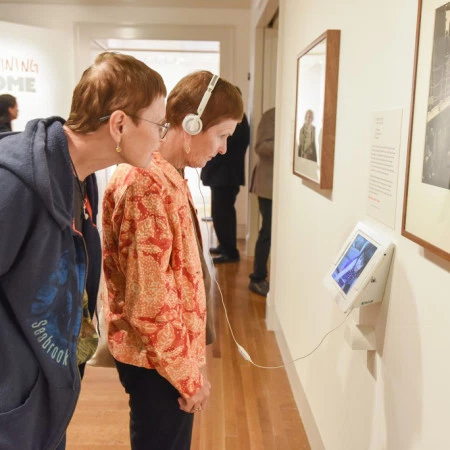 Small changes like this, from personal audio tours to headphones and captioning, benefit all visitors and can be seen in museum installations from smaller museums like the BMA to the Smithsonian (Johnson 4). Overall, museums are shifting to become as accommodating as possible, not only for trips scheduled weeks in advance but also ordinary encounters within the museum. The presence of special events and tours specifically for the Deaf community represents an inclusive ideology and desire to make connections with all audiences, regardless of disability. The museums of the present still do not always have everyday tours or audio content that is structured for the Deaf and HOH communities, but as technology advances and museum staff become more conscientious of this demographic of visitors, accessing the museum can only become easier. *note: Hard of Hearing refers to individuals who have some form of mild-to-moderate hearing loss, deaf refers to individuals with the audiological condition of not hearing, and Deaf refers to individuals who share a language and a culture. Chan, Seb. “Experiencing the O at MONA: A Review.” Fresh & New(er), Oct. 27, 2011. “Deaf and Hard of Hearing Family Event.” Boston Children’s Museum. N.p., n.d. Web. 28 Apr. 2016. “For Visitors Who Are Deaf.” The Metropolitan Museum of Art. N.p., n.d. Web. 29 Apr. 2016. Johnson, Kristina. “Accessibility for Deaf and Hard of Hearing Audiences at Cultural Institutions.” Art Beyond Sight. N.p., n.d. Web. 28 Apr. 2016. Proctor, Nancy. “Providing Deaf and Hard-of-Hearing Visitors with On-Demand, Independent Access to Museum Information and Interpretation Through Handheld Computers.” Museums and the Web. N.p., 2005. Web. 28 Apr. 2016.